Windows PowerShell is one of the most prominent CLI environments. This is perhaps the default CLI for anyone on Windows and even though Win10 allows Bash I still think PowerShell will hold its ground for many years to come. However because it’s such a complicated topic it can be off-putting to new users. Is it a CLI or a scripting language? Is it proprietary or are there 3rd party extensions? All of these questions can be answered with the right learning materials. In this post I want to share the absolute best PowerShell books for everyone from complete newbies to more experienced scripters. Regardless of your knowledge level you can easily find something in this post to up your PowerShell game to the next level. 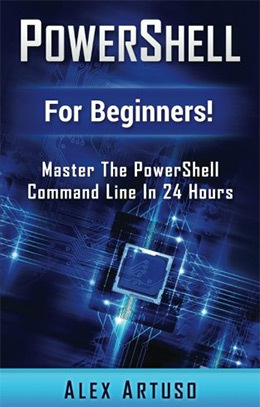 For absolute beginners with little-to-no experience in the CLI there’s only one book I’d recommend to start: PowerShell For Beginners! It covers all the fundamentals you need to know but the writing style is very relaxed and simple to follow. This is crucial for someone with less technical knowledge who wants to learn PowerShell without the overly-confusing technical language. 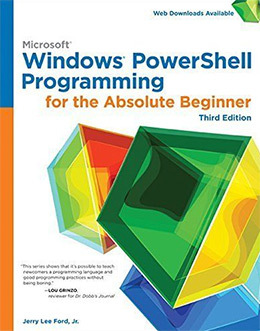 Currently in its 3rd edition, Windows PowerShell Programming for the Absolute Beginner is one of my favorite books to skim through and recommend for absolute beginners. This book focuses on Windows management and some game development, so it may not be the perfect choice for everyone. But it is one of my favorite books because of how the content is presented and how easy it is to consume. Everything in the 3rd edition covers PowerShell v3/v4 but it’s so basic that it can work for all future versions too. You’ll learn about the basics of automation, logs, and handling the Windows registry with updates/changes. Concepts are super easy to understand even with no programming background. And clocking in at 480 pages I think this is one of the lengthier programming books you can get. The biggest drawback from studying PowerShell is the technical aspect. Many people get scared because of the innate jargon that just sounds incomprehensible to the normal human ear. But PowerShell For Beginners! takes this concept and throws it out the window. This book is made for less tech-savvy individuals who desperately want to understand the power of Windows PowerShell in the real world. This book focuses primarily on the command line and it’s written solely for beginners(hence the title). Even if you have a little experience with the Windows CMD it’s still worth grabbing this book to brush up. The writing style is super simple to understand. For a complete beginner I couldn’t think of a better book to recommend. Another option for absolute beginners is Windows PowerShell Step by Step. I find this content a little more verbose and technical, but it’s also very accurate. The book is currently in its 3rd edition totaling just over 700 pages long. 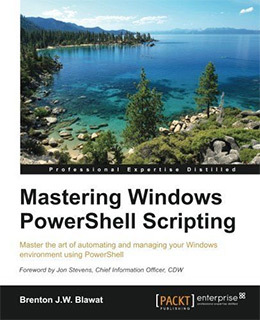 The author Ed Wilson is a recognized scripting expert by Microsoft and his name is widely known in the PowerShell community. Since this book is a little newer it gets into some of the features you’ll find in PowerShell 5, along with the core features that run on all versions. You’ll learn about command line utilities and how to create your own batch-style scripts to automate your workflow. Other more advanced topics include managing Active Directory, WMI systems, handing software services, and learning to debug your own scripts. You do not need prior experience but you do need some tenacity to work through this book. It is made for beginners but the detailed writing style mostly targets tech enthusiasts. 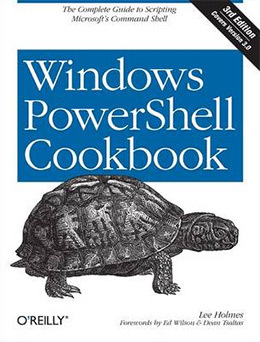 As far as cookbooks go this is one of the best in the PowerShell library. The author Lee Holmes frequently gives talks on PowerShell and publishes content for the Microsoft blog on new PowerShell features. The Windows PowerShell Cookbook is freaking massive. It totals over 1,000 pages long with just over 100 unique recipes to choose from. Holmes doesn’t just list recipes willy-nilly. He actually organizes content in a way so that you understand what you’re reading and what it means. He guides you along each recipe to help you understand how it should be used and what problem(s) you’re solving. Some recipes get into fairly mundane content like Active Directory management and the object-based pipeline features. But Holmes also gets into .NET scripting and more complicated CLI features. I’d recommend this for skilled PowerShell users who want a massive desk reference to solve common problems while working in PowerShell(both desktop and server environments). Every book from Manning continues to impress me with great writing and detail that you simply can’t find elsewhere. 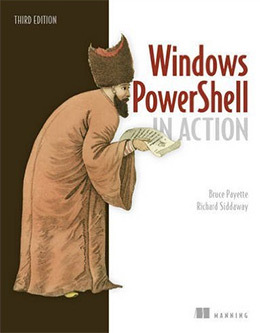 Windows PowerShell in Action is currently in its 3rd edition and it easily spans over 1,000 pages. This may seem like just another recipe book, but it’s so much more than that. PowerShell in Action teaches you how to use PowerShell with real case studies and live examples. If you already feel comfortable with PowerShell then you may be using it here-and-there throughout your daily routine. But if you really want to become a power user then this book will get you there. It covers a huge variety of use cases for PowerShell ranging from IT professionals to server administrators and programmers. The chapters list is huge and this book is undeniably the best way to go from an intermediate to a super advanced PowerShell user. Once you understand how PowerShell works and why you’re using it you’ll be eager to cement a workflow. But the difficult part is figuring out the best workflow and how this fits into your daily activities. I’d recommend Mastering PowerShell to anyone who wants to improve their existing PowerShell workflow. The book is fairly short at only 220 pages. But it covers all the advanced topics of automation, debugging, and writing scripts with best coding practices. You’ll learn about managing folders and registry entries all through PowerShell. This includes detailed user account permissions and even complex regular expressions within your PowerShell scripts. Once you understand common workflows for everyday tasks you’ll have a much easier time implementing PowerShell on a routine basis. And this book will get you there by teaching you the right way to automate scripting. Regular users may not have a need for small pocket references but IT managers and server admins will be working in PowerShell 24/7. 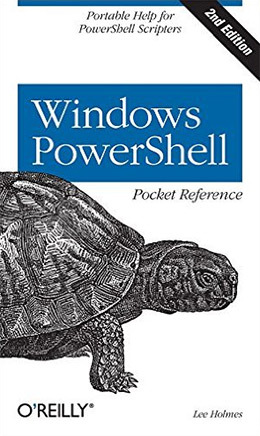 That’s why the Windows PowerShell Pocket Reference is a valuable asset and super affordable to boot. This book is written by Lee Holmes, the same author of the 1,000 word PowerShell cookbook mentioned earlier. The tips in this pocket reference are incredibly valuable for .NET, XPath, WMI, and COM object work. You can look up quick scripts or solutions for common problems with ease. Plus the book measures 4″ x 7″ so it’s very light and easy to store near your workstation. Unfortunately the latest release came out in December 2012 so it only covers PowerShell 3.0. If you still work on legacy systems this book can be a huge asset. 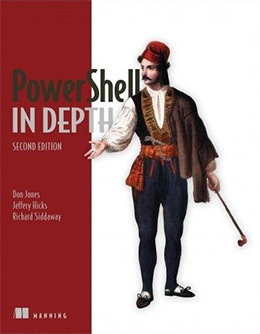 But if you’ve already moved onto PowerShell 5+ then you might want to wait for the 3rd edition. Everyone from web developers to system administrators realize the power of SQL databases. They’ve been around for decades and I don’t expect them to fade away anytime soon. If you’re familiar with Linux then you’ll know the command line is a powerful SQL tool. This is also true of PowerShell and the goal of PowerShell for SQL Server Essentials is to teach you how this works. With this book you’ll start from scratch with SQL processes learning how to install, update, and manage complex SQL databases. This includes the process of automating certain scripting problems or CRON jobs running on the server. But PowerShell can even be used to perform RegEx searches against lengthy database tables or to mass prune/update users. There’s a seemingly endless supply of SQL tricks with PowerShell and this book is a great place to start learning. Once you’re already comfortable with PowerShell you’ll want to dig deeper but may not know how to get there. PowerShell in Depth by Manning is one of the best books on the market with a hands-on tutorial approach to each exercise. The book has over 700 pages with just over 40 chapters covering a wide variety of advanced PowerShell techniques. This can work as a reference guide or as a study tool and it’s pretty easy to jump around from chapter to chapter if you want to study particular topics. I’m impressed with the depth and quality of each tutorial in this book. It’s definitely not for beginners and even intermediate PowerShell users may need to take their time working through these lessons. But by the end you’ll certainly be a master of PowerShell and know how to use it for almost every situation. We actually published a review of this book if you want to read more about the content. And this book comes with a free digital copy so it’s a great choice for anyone who likes access to both the physical & digital versions. This is the newest book in my list and it’s also one of the most complicated. 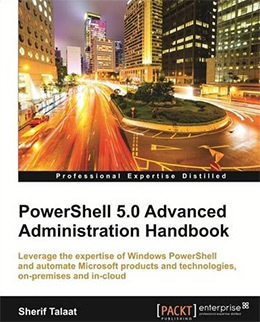 PowerShell 5.0 Advanced Administration Handbook teaches all the new features in PowerShell 5.0 including the updated syntax, the Desired State Configurations and how to manipulate Office 365 from the PowerShell CLI. The author covers typical features like .NET and gets into Microsoft Azure, along with many other proprietary MS tools. You’ll learn a variety of skills including web development, server maintenance, and power user techniques on Windows 10. This book is mostly aimed at anyone who wants to learn the newest features of PowerShell 5.0 so it does require that you have some background working in PowerShell. But even if you’re somewhat of a novice you can pick up this book and learn a lot from the exercises. PowerShell is one beastly program and there’s no right or wrong way to approach it. Some users come from a technical background with Bash while others have never touched a command line prompt. If you’re a complete beginner I’d absolutely recommend PowerShell For Beginners! as your first book. 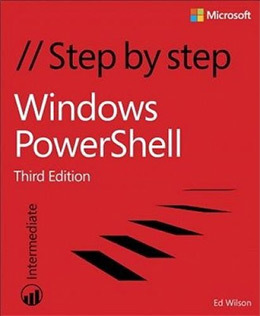 But if you already have some technical knowledge and want to dive right into PowerShell then I’d recommend Windows PowerShell Step by Step since it’s longer and more detailed. However the more advanced books are only valuable on a case-by-case basis. 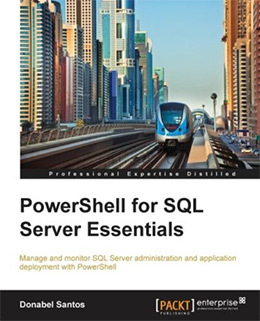 Some people may need an IT tech reference while others may need a detailed tutorial on PowerShell for databases. You can find all of that(and more) from the titles in this post. Browse through this list and if anything looks appealing check it out further on Amazon. Many publishers update their tech books with newer editions so always search for the most up-to-date version before buying.